Mr. Hulse was born and raised a 6th generation Mormon. He remained in the LDS Church until he came to saving faith in Christ in 1986. Mr. Hulse and his wife, Helen, are the directors of the Nauvoo Christian Visitors Center in Nauvoo, Illinois. 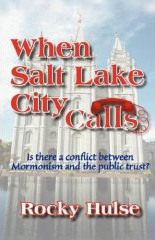 Heavily weighted with lengthy quotes from LDS authorities and manuals, When Salt Lake City Calls is fully documented, resulting in arguments that are quite compelling. This sounds like a book I’d like to read. Thank you for featuring it here. I was just rereading some historical information regarding the Nauvoo days of the Mormon Church. Joseph Smith wanted to be a political force. He demanded absolute loyalty and control. My guess is that there will be a lot of explaining away regarding the oaths. Much like the explaining away of certain doctrines of the Church. I’ve concluded that in order to be a functioning Mormon, a person has to ignore a lot of the history, doctrine and many of the prophetic proclamations of the leaders as well as the covenants and endowments. I would guess that Mitt Romney, for example, is far enough up the LDS food chain that he feels free to pick and choose what he takes seriously. I’d just like to add that as a Christian, I answer to God, not to a prophet or a church. Additionally I don’t know of any Christian denomination that demands the kind of surrender to the organization that LDS does.